Acupressue do it yourself therapy. A revolutionary exposition from Ayurveda-the ancient Health Science of India. A most precious gift given to Mankind bu Nature. The only Health Science which assists you in preventing diseases, diagnosing them and curing them without Drugs and any side effects. 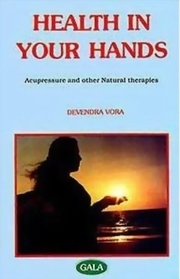 World renowned Acupressurist Dr. Devendra Vora has analysed that the pressure applied on certain points located in the palms and soles helps to stimulate all organs of the body, prevents diseases and assists in maintaining good health. Accupressure also enables one to diagnose and cure diseases like Common Cold, Diabetes, High Blood Pressure, Migraine, Heart Attack, Paralysis and even Cancer. Dr. Devendra Vora has proved that all dreaded diseases like Allergy, Cancer, Thalassaemia and HIV/AIDS are only Paper Dragons which can be easily defeated. These two volumes are unique in the sense that they will give great relief to worrying mankind. The learned author has shown how all these dreaded diseases can be prevented and cured. And all that without any cost or side effects. This book teaches you how easy it is to maintain good health and prevent old age. Easy to understand and very simple to practise, even a child of 10 years can practise it. The book shows ways and means to prevent and cure all types of dreaded diseases like Cancer, Muscular Dystrophy, etc.